Happy Multicultural Children's Book Day! Even if you missed this year's event on 01/27, you can catch up on all the amazing books and resources shared here via the linkups. The 2017 Newbery Winners. Another overview post, this time for this year's Newbery winners (which, for the first time ever, I had all already read). I was so, SO excited about the winner! Pack-n-Go Girls review. For MCBD I reviewed one of the newest books from the Pack-n-Go Girls, a travel and adventure series for lower elementary. 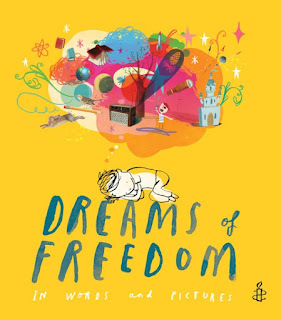 Dreams of Freedom in Words and Pictures (2015) by Amnesty International. Where do you even start to process the events of this past weekend? For me, I am launching a family history and immigration study with my seventh graders today that has been on the curriculum calendar for ages. I can only begin to imagine the conversations and questions they'll have. I found out about this book, Dreams of Freedom in Words and Pictures, from the latest Diverse Children's Book linkup, in a post about social justice books. Each page contains an important freedom, along with a quotation and artwork from a variety of public figures and well-known artists. I think this book will spark some powerful discussions - and could be a great mentor text for creating your own class book! 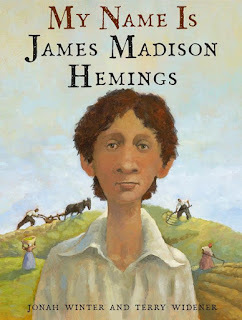 My Name is James Madison Hemings (2016) by Jonah Winter and illustrated by Terry Widener. This powerful picture book imagines what it would have been like to be James Madison Hemings, one of several sons of slave Sally Hemings and eventual-President Thomas Jefferson. The author's note does a good job of discussing the sources used in creating the story, as well as the historical context. This book could also provide an avenue of discussion with older students about "passing" or the "one drop rule" when discussing what it means to be considered black. 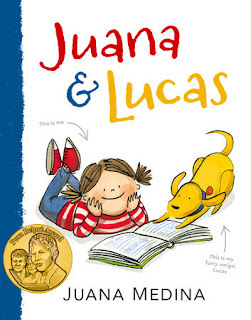 Moving up to middle school this year has moved my reading focus away from Young Fiction, but I knew I wanted to check out Juana & Lucas after its surprise Pura Belpré Author Award win last week. Juana is a young girl who lives in Colombia with her family and dog, Lucas. She has a best friend, gets in trouble at school, and cannot figure out why she needs to learn the tricky English language. Only when Abuelo reveals a motivating reason, does she dig in with earnest. I found this a charming story and one that I think many kids learning Spanish would relate to. Language learning is hard work! Ugh...my heart is hurting and my head is spinning...what on Earth is going on in the world? I'm so glad that we have dedicated teachers who are working hard to cultivate empathy and openness in the classroom. Thanks. I'm so glad I have an online community of other caring teachers and librarians for support! What an topic for students to explore right now - So glad to hear that you have the opportunity to teach your students how to explore issues from multiple perspectives. Thanks for the link to the diverse books about social issues. We will pass that along to other teachers. All of these books look like delicious reads. I feel like Jane today. We need these kinds of books, and teachers ready and willing to take on social justice issues, more now than ever. Dreams of Freedom is really important. Such an incredible title to share with our students.